Without a doubt, Google is the search engine most users go to whenever they want to do a quick search for ideas, keywords, pictures, sounds, or just about anything. Google can even search by image instead of keywords. Suppose you have a picture on your computer and you want to see if the picture is already being used by other sites on the web. Using Google, you can a search for the picture using the image file from your PC. Google’s Reverse Image Search function allows users to upload photos so Google can analyze the image file and return results based on the search engine’s analysis. 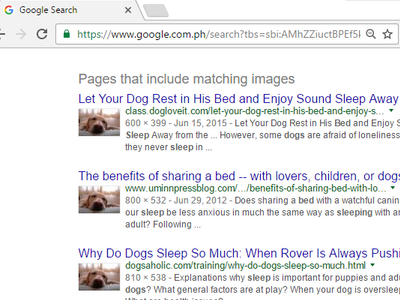 Use the steps in this tutorial to do a Google Reverse Image Search. 2.Search for any word on Google’s search box. 3.On the results page, click on the Image tab. 4.You are now on Google’s Image search feature. 5.Click on the camera button at the right side of the search button. 6.Click on the Upload by Image tab. 7.Click the Choose File button. 8.Locate the image that you want to search. Click on the file. 9.Click on the Open button to initiate upload. 10.Wait for the upload to complete. 11.Search results for the uploaded image will be displayed. Pages that include the matchings images will also be in the search results. You are done. 2.Search for any word in Google’s search box. 5.Go to your preferred image file’s location. 6.Click, hold and drag the selected image file to Google’s Search button. 7.The image will now be uploaded to Google’s servers. Wait for the upload to complete. 8.The results for the image file will now be displayed including web pages that are using the matched image. You are done. 1.Go to the site where the image that you want to search is embedded. 2.Right-click on the target image. 3.Click the Search Google for this image option. 4.A new tab will open and will display the results of the reverse image search. You are done. If you have questions with any of the steps above, leave us a message in the comments section.